I've put up images from the 2005 Cambridge Christmas Revels...click here! I created the original Revels Website in November, 1997, and was Revels Webmaster for 5 years. Since Revels, Inc. no longer wishes to host the pages devoted to some of the older shows, I've placed the retrospective pages on shows from 1995 to 2001 on one of my own sites, for the benefit of cast members and nostalgic fans. The 2001 Spring Revels focussed on the great waves of immigration in the nineteenth and twentieth centuries from Europe to the United States, and particularly, to Boston. Immigration brought together people who knew little about each other's heritage and customs but who were determined to make a life side by side in the New World. We hope you joined us on our big front porch and enjoyed the moving harmonies of The Silver Leaf Gospel Singers, a 6-voice a capella gospel choir that's been together for more than fifty years (and who've vowed to keep singing together "until the angels get happy"). And while you're there, stayed a while and listened to the quiet beauty of a Tennessee lullaby sung by 7th generation Appalachian singer and storyteller, Sheila Kay Adams, another of our many featured performers. Also appearing was a wonderful string band, the 40-member Revels Chorus, The Rocky River Children, The Smoky Mountain Dancers, The Cambridge Symphonic Brass Ensemble, and frequent Revels performers Janice Allen and David Coffin. We danced through the grand lobby of Memorial Hall as David led the audience in Revels' signature piece, "Lord of the Dance," a true ritual of our own. Spring Revels 2000 took us on a waterways journey with its start in Acadia, an area of Nova Scotia and New Brunswick first settled by French colonists in the 1600s. When the British took control of Canada in 1713 these early pioneers chose exile over answering to a foreign authority. Many took the long river route to the south, down the Mississippi to the Louisiana territories where eventually they became known as "Cajuns." Directed by Patrick Swanson, Spring Revels followed the fortunes of these early pioneers in a musical journey suggested by Longfellow's epic poem Evangeline. It was an exuberant celebration of Spring in typical Revels style: from the distinctive fiddling and dancing of a Cape Breton barn raising to the noisy street celebration and spicy melodies of a Cajun Mardi Gras. Spring Revels boasted an outstanding ensemble including Acadian recording artists, Barachois, exhilarating musicians from Prince Edward Island that kept the audience's toes tapping! Other performers included acclaimed actress Paula Plum, and musician Tom Pixton. Revels, Inc., in collaboration with Tina Packer's Lenox-based Shakespeare & Company, produced a special millennium production of The Mysteries, two weekends in March at the Boston Center for the Arts Cyclorama Building in the South End. Originally produced to great international acclaim by the Royal National Theatre of Britain in 1985, The Mysteries is contemporary British playwright Tony Harrison's adaptation of plays from the York, Chester, Wakefield and Coventry traditions originally written and performed by working men, craftsmen and members of the Guilds. The 1999 Christmas Revels was set in the Italian Renaissance, an age when Science, Art and Music experienced a magnificent rebirth. This astounding burst of creative energy led to a tremendous flowering of the arts (including painting, architecture, music, sculpture and dance) and prolific invention in the world of science. Revels favorite David Coffin led an extraordinary company of singers and musicians including the Renaissance dance band Renaissonics, led by John Tyson on recorder, pipes and fiddle, and the a cappella early music trio, Tapestry, with mezzo-soprano Laurie Monahan, alto Daniela Tosic and Cristi Catt, soprano. The performance began at the turn-of-the-century, dockside in Boston Harbor.Peddlers and newsboys spilled about the bustling streets, filling the air with a cacaphony ofstreet cries. Before it's over, our theatrical voyage took us from the docks to the sea, withthe fishermen and whalers, to the Carribean with its pounding island rhythms and Carnival-like festival of Junkanu and, eventually, back home to safe harbor. The 1998 Christmas Revels took us on a Dickensian journey through Victorian England and the wonderful music, songs, dances and carols of that lively and colorful era. Featured performers includedBritish folk singer/tradition bearer David Jones; pianist Jacqueline Schwab, a frequent musiccollaborator of documentary film maker Ken Bums and a member of "Bare Necessities;" actors PatrickEnglish, Sarah deLima and Richard Snee; the 40-member Revels Chorus; a merry company of Music Hall "artistes;" the Pudding Lane Waits; the Dingley Dell Dancers; a magnificent parlour orchestra; theCambridge Symphonic Brass Ensemble; a double-dose of Morris dancers from The Pinewoods Morris Men and the Rose Galliard Northwest Morris; and even British "royalty" in the guise of the(aptly-named) "Pearly" King and Queen! The1997 Midsummer Revels traveled North, into Eastern Canada and the Maritimes for a special French Canadian program featuring lively and traditional music, rituals, step dancing and folk tales. Largely influenced by French and British territorial settlers, French Canadian culture is enormously rich and vital. Sharing their music, songs and stories will be a pair of exceptional Québecois musicians, Benoît Bourque and Gaston Bernard who were joined onstage by Cape Breton fiddler and local favorite Joe Cormier. 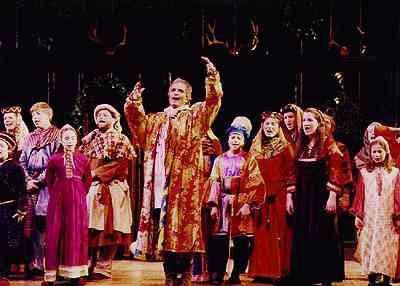 The 1997 Christmas Revels explored the mysterious and fascinating culture of the Romany Gypsies, following these nomadic people from their origins in Northern India to their travels through Eastern Europe to England and France and ultimately, to Andalusia in Spain. The scope of the 1997 Christmas Revels was broad and included spectacular stories, music and dance from a variety of sources. Heading a cast of more than 80 performers was master storyteller Jay O'Callahan as "Old Rom", a mysterious but respected elder who knows the old tales which link Travelers from all times and places. Other performing artists included The New England Romanian Ensemble. Neena Gulati and members of the traditional Indian dance company Triveni Dance, Roberto Rios and El Arte Flamenco. This show, at Lincoln's De Cordova museum, was focussed on the "Tinkers" or "Travelling People of Ireland and the British Isles. The 1996 program took us on a journey to 19th-century Brittany, in Northern France. Set in a region rich in ancient stone circles and soaring cathedrals, this Breton Revels transported us, via the magic of storytelling, to an age of chivalry and romance, of bombardes and bagpipes, and the time of King Arthur and the Knights of the Round Table. Master troubadour John Fleagle, formerly of Project Ars Nova and a frequent Boston Camerata soloist, rejoined the Revels in a featured role. The ultra-versatile singer and instrumentalist was joined onstage by David Coffin and the 50-member Revels Chorus of adults and children, the Cambridge Symphonic Brass Ensemble, The Pinewoods Morris Men and some of the finest early instrumentalists in New England playing pipes, shawms, pennywhistles and Celtic harp. To celebrate is to pay attention to something special, and to mark this 25th year we have come home. Imagine (as did the first Revels audience) that we are in England, in the Banqueting Hall of a mediæval castle, awaiting the arrival of a great King and the commencement of the annual festivities. Our companion-in-waiting is the Fool (who has the least comfortable seat in the house, and is ready to represent the grievances of those of you in partial-view seats). which lies very deep in all of us. Revels Revels was founded in 1971 by award-winning author and musician John Langstaff and his daughter, Carol to promote the understanding and appreciation of traditional folk music, dance and rituals from around the world. Patrick Swanson is Revels, Inc.'s National Artistic Director. John Langstaff is Director Emeritus. From a modest start in Cambridge, Massachusetts, more than thirty years ago, Revels, Inc. has grown into a national, year-round organization which provides unique opportunities for communal celebration. Fully staged and costumed seasonal performances blending traditional music, dance, drama, and ritual are presented by a large volunteer chorus of children and adults drawn from the community, and a number of highly talented professional actors, musicians, artists, directors and "bearers of tradition" from many cultures. Audience participation is also a Revels trademark. Many different Revels productions occur annually in eleven cities across the country:Cambridge and Boston, Massachusetts; New York City; Washington, D.C. ; Hanover, New Hampshire; Oakland, California; Philadelphia, Pennsylvania; Houston, Texas; Minneapolis/St. Paul, Minnesota; Tacoma, Washington; Portland, Oregon; and Chicago, Illinois. The newest Revels company is Rocky Mountain Revels, in Boulder, Colorado. In addition, many smaller Revels-inspired productions are performed in various small towns throughout the nation. Revels also offers educational programs in schools and occasional workshops for teachers. Revels produces and sells compact discs, cassettes,songbooks, and educational materials. Revels, Inc. was founded in 1971 and incorporated in 1974 as a nonprofit, tax-exempt organization to further the production of Revels performances and related projects. Revels, Inc. is supported, in part, from funding received from the Massachusetts Cultural Council, a state agency.